Greenland Express (Keflavik and Aalborg) has suspended operations according to this report by check-in.dk. The flights were being operated with a Fokker 100 operated by Denim Air (above) twice-weekly. The flights from Denmark were making a technical stop in Keflavik, Iceland which was adding to the costs incurred by the company. According to the report, the company intends to restart operations with new investors and will look at possibly using an Airbus A320 for nonstop flights to Greenland. Greenland Express will lease the aircraft directly from the leasing company. Copyright Photo: Ton Jochems/AirlinersGallery.com. Denim Air’s Fokker F.28 Mk. 0100 (Fokker 100) PH-MJP (msn 11505) prepares to taxi to the runway at Amsterdam. This entry was posted in Denim Air, Greenland Express and tagged 11505, AMS, Amsterdam, Denim Air, F.28, F.28 Mk. 0100, F100, Fokker, Fokker 100, Fokker F.28, Fokker F.28 Mk. 0100, Greenland, Greenland Express, Iceland, Keflavik, PH-MJP on September 23, 2014 by Bruce Drum. Greenland Express has had to deal with two cancelled flights and other operational issues recently with operator Denim Air (Amsterdam) according to Nordjyske.dk. According to the report, the airline has issued refunds for the cancelled flights. Greenland Express CEO Gert Brask also stated to the Danish website that a new investor will have to be found in the future. He will determine the time when new capital is needed. 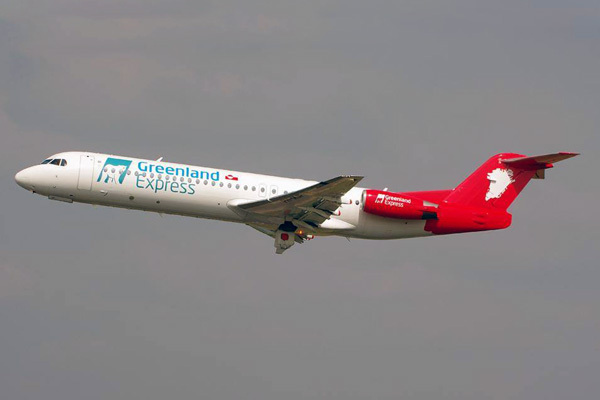 Greenland Express Air is a Greenlandic/Danish virtual airline, established in the beginning of 2013. Greenland Express Air chose Dutch flight operator Denim Air to operate the flights. Greenland Express Air uses a Denim Air 100-seat Fokker 100 aircraft (above) on flights between Denmark and Greenland. Copyright Photo: Greenland Express. Denim Air’s Fokker 100 (F.28 Mk. 0100) PH-MJP (msn 11505) has been operated for Greenland Express in their colors since the start of services on June 17, 2014. This entry was posted in Denim Air, Greenland Express and tagged 11505, Denim Air, F.28 Mk. 0100, F100, Fokker, Fokker 100, Greenland, Greenland Express, PH-MJP on July 31, 2014 by Bruce Drum. 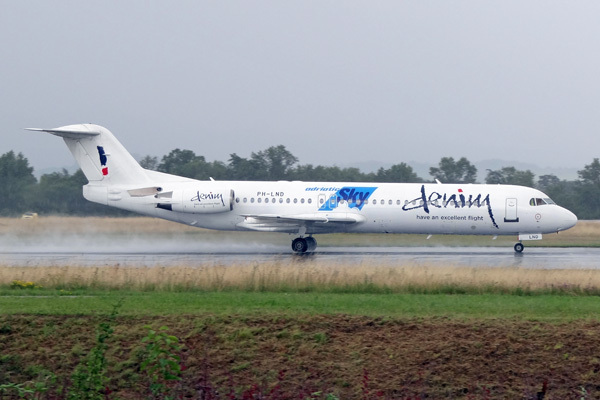 Adriatic Skyways (Dubrovnik) has started charter operations from Basle/Mulhouse/Freiburg (EuroAirport) to Pristina using a wet leased Denim Air Fokker F.28 Mk. 0100 (Fokker 100) PH-LND according to ch-aviation. Adriatic Skyways has joined forces with the Dutch AOC Holder Denim Air ACMI B. V. The flights will be operated by Denim on behalf of Adriatic Skyways, all other commercial operations are run by Adriatic Skyways. Denim was carefully selected by Adriatic Skyways to become its single and exclusive airline partner. Denim has established an impressive track record as a regional aircraft operator. They have operated on behalf of airlines, companies, tour operators and other groups since 1996. Denim focuses on operational excellence, rather than ticket sales. The optimization of the flight operation in terms of reliability, punctuality, and passenger satisfaction has the highest priority. Denim operates Embraer E190, Fokker 50 and Fokker 100, and confirms that they have these aircraft available. Adriatic Skyways is established to promote and develop airline traffic from the Balkan region. Its expertise lies in the commercial operation of an airline, rather than the operational. Adriatic Skyways focuses on the contacts with tour operators, local tourism agencies, hotels, governments, etc, in order to increase traffic and tickets sales from the region. The business model excludes starting its own AOC to stay lean and low cost, and therefore Adriatic Skyways has selected Denim Air ACMI as its operator. The aircraft are in Adriatic Skyways livery and the flight program is managed by Adriatic Skyways. The entire flight experience for the passanges is an Adriatic Skyways product. Copyright Photo: Paul Bannwarth. Denim Air’s Fokker F.28 Mk. 0100 (Fokker 100) PH-LND (msn 11320) carries joint titles for this new operation. Oddly the titles on the aircraft “Adriatic Sky”. This entry was posted in Adriatic Skyways, Denim Air and tagged Adriatic Sky, Adriatic Skyways, Basel, Basel/Mulhouse/Freiburg, Denim Air, F.28, F.28 Mk. 0100, F100, Fokker, Fokker 100, Fokker F.28 Mk. 0100, Pristina on July 25, 2014 by Bruce Drum. Due to events beyond our control, Greenland Express Air is forced to postpone the start up of our new routes between Greenland, Denmark and Iceland for 15 days. Thus, the initial flight is now moved from June 2, 2014 to June 17, 2014. Greenland Express Air uses the Dutch aircraft supplier Denim Air ACMI as operator of the Fokker 100 aircraft which is being used for the routes, and Denim Air ACMI is still awaiting the Dutch aviation authorities’ approval of the aircraft register on the company’s AOC (Airline Operators Certificate). Denim Air ACMI has informed Greenland Express Air that this approval is expected within the next few days. Hereafter, registering of the aircraft on the AOC is subject to approval from the Danish aviation authorities. The Fokker 100 aircraft arrived as scheduled to its new base in Aalborg Airport on June 2, in Greenland Express Air livery. The aircraft has been declared ready for operations. Greenland Express Air also has a spare aircraft available under our agreement with Denim Air ACMI. The spare aircraft is being painted into its new livery during this week. The spare aircraft is already registered on Denim Air ACMI’s AOC, and it is expected ready for flight operations no later than the new date for initial flight operations. The spare aircraft will be based in Holland and can enter into service with a few hours’ notice, should it become necessary. Passengers who are already booked on Greenland Express Air flights affected by the above stated cancellations have been contacted directly and have been either re-booked with other carriers, re-booked at later departure dates or have received a refund of their ticket, depending on the wishes of each passenger. *Routing from fra Narsarssuaq is via Kangerlussuaq. Copyright Photo: Greenland Express. The tail of Denim Air’s PH-MJP. This entry was posted in Denim Air, Greenland Express and tagged 11505, Denim Air, F100, Fokker, Fokker 100, Fokker F.28, Fokker F.28 Mk. 0100, Greenland Express, PH-MJP on June 6, 2014 by Bruce Drum. 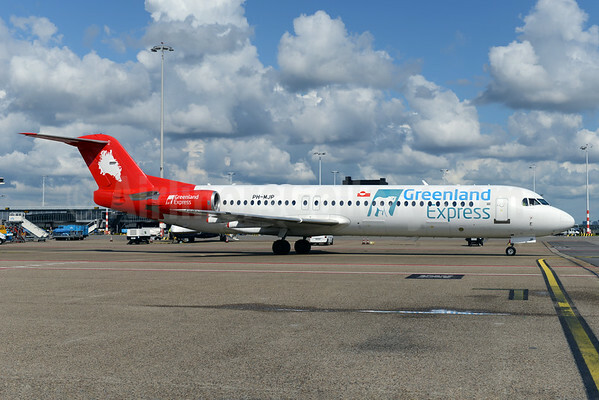 Greenland Express will start scheduled passenger operations using a wet-leased 100-seat Fokker 100 from Denim Air on June 2 on the routes above. The first Fokker 100 will be delivered in late May and will be flown in Greenland Express colors. The wet-lease is for three years. Previously the new airline had looked at Airbus and Embraer aircraft but settled on this current arrangement. This entry was posted in Denim Air, Greenland Express and tagged Denim Air, Fokker 100, Greenland Express on April 24, 2014 by Bruce Drum. 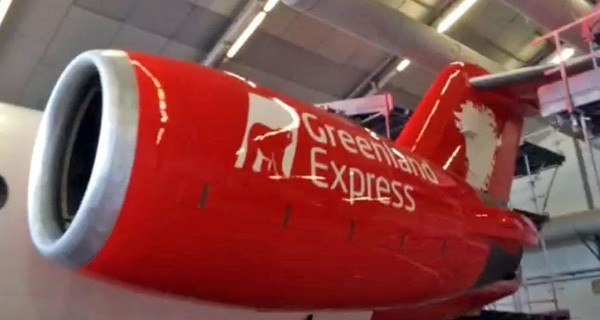 Greenland Express (Greenland Express Air) is a new airline that expects to launch scheduled passenger operations in March or April. Denim Air will operate an Embraer 190 for the new airline. The up-start has merged with Air Arctic and Eyjaflug. The basic idea of Greenland Express is to provide affordable traffic between Greenland, Denmark and other destinations in the North Atlantic markets, while Air Arctic will be the perfect provider of connections between our hub in Greenland and domestic destinations in this country, says Gert Brask, Greenland Express. We have solidified our cooperation by taking stakes in each-others companies. Air Arctic thus now holds 40 percent of the shares in Greenland Express while my holding company retains 60 percent in Greenland Express as well as one-third in each of the two companies held by Air Arctic through fresh capital brought in by Air Arctics investors in Iceland and USA, says Mr Brask. 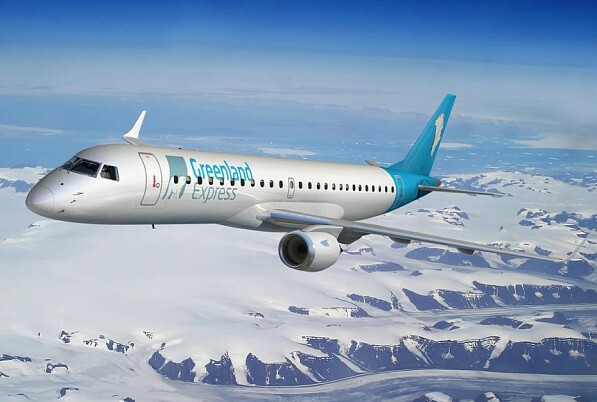 As earlier reported by newstodate, Greenland Express is to launch flights from spring 2014 with wet-leased Denim Air Embraer 190 aircraft operating on the basis of the Dutch carrier’s AOC that is immediately valid in all EU countries while still awaiting the Dutch authorities’ clearing for Arctic operations. At the same time, Air Arctic is working on a new business plan including implementation of a fleet program comprising new ATR aircraft as well as larger jet aircraft for ACMI and charter services offered in the European market. The Dutch CAA has now amended the Dutch carrier Denim Air’s AOC to allow for arctic operations. 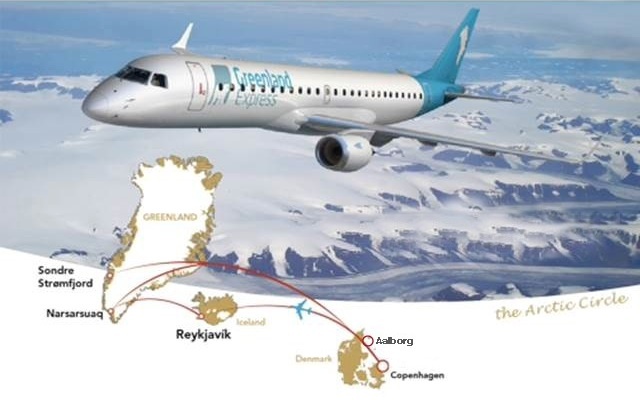 Denim Air will provide flights for Greenland Express with an Embraer 190 aircraft capably of operating the North Atlantic routes connecting Greenland and Denmark as well as other points in the region within a route network yet to be announced. Prior to this, Greenland Express has also obtained all other pertinent permits and commercial rights required to approach the market. This entry was posted in Denim Air, Greenland Express and tagged Denim Air, Greenland Express, Greenland Express Air on January 9, 2014 by Bruce Drum. 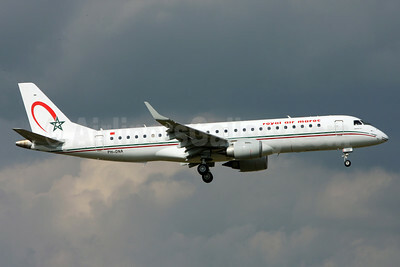 Royal Air Maroc (Casablanca) has put into revenue service its first Embraer 190. The pictured former Gulf Air ERJ 190-100 IGW PH-DNA (msn 19000372) was delivered on July 19 and is being operated by Denim Air for RAM. Copyright Photo: Andi Hiltl/AirlinersGallery.com. PH-DNA is pictured arriving at Zurich today. This entry was posted in Denim Air, Royal Air Maroc and tagged 19000372, Denim Air, Embraer, Embraer 190, Embraer 190100, Embraer ERJ 190, Embraer ERJ 190100, ERJ 190100, PHDNA, Royal Air Maroc, ZRH, Zurich on July 24, 2013 by Bruce Drum.